Since 1958, Foundation For The Carolinas has inspired philanthropy and charitable investment in the vibrant region we serve. Established with a $3,000 gift from the United Way in 1958, Foundation For The Carolinas has grown to more than $2 billion in charitable assets. We are now among the largest community foundations in the United States – a reflection of our region’s spirit of generosity. 1958: On Jan. 7, 1958, 24 of the city’s most distinguished leaders create the United Community Foundation to accept and distribute charitable gifts, to make sure donors’ wishes are carried out in perpetuity and to build a permanent “nest egg” for broad community needs. The original service area is Charlotte and Mecklenburg County, and the first gift of $3,000 comes from the United Way. 1963: Foundation assets exceed $100,000 and distributions grow to $27,000. 1965: Longtime Foundation supporter Maybelle Y. McMahon dies and leaves the bulk of her estate to the Foundation to create its first discretionary endowment. 1967: Assets reach $265,000 and distributions total $72,000. The Foundation’s name is changed to the Greater Charlotte Foundation, Inc. “Anyone Can Be A Philanthropist” becomes Foundation’s motto. 1974: Foundation is revitalized with Edwin P. Latimer as president. Foundation assets total $469,118. 1976: Foundation assets double to $1.1 million. 1978: Foundation opens its own office for the first time. Gordon Berg, Barbara Hautau and Judy Kerns leave the United Way to staff the Foundation. Assets double again to $2.6 million, and distributions total more than $500,000. 1983: 25th Anniversary. Foundation assets grow to $11.2 million, and distributions top $2 million. Service area expands to include all of North Carolina and South Carolina. 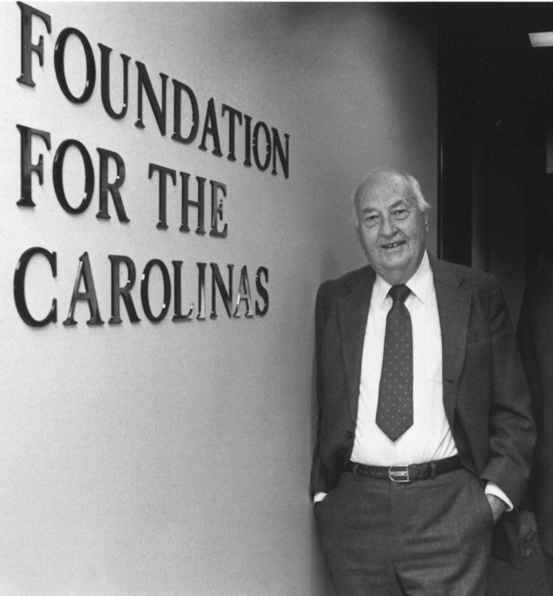 1984: Foundation’s name changes to Foundation For The Carolinas. The Neighborhood Grants Program starts with a grant from Charles Stewart Mott Foundation. 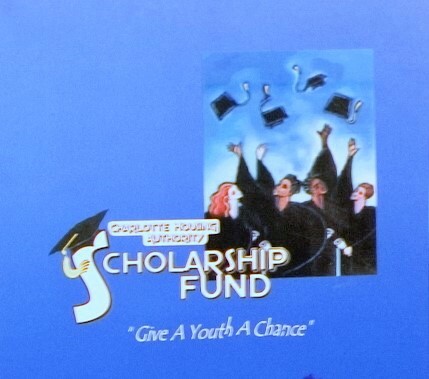 Charlotte Housing Authority Scholarship Fund awards its first scholarships. The first regional affiliate community foundation is established in Cleveland County. 1986: Assets double from previous year to more than $35 million, and distributions total $4 million. Impending tax law changes in 1987 prompt almost $20 million in gifts. Major gifts include Belk Brothers property (valued at $3.1 million) for the proposed Performing Arts Center. 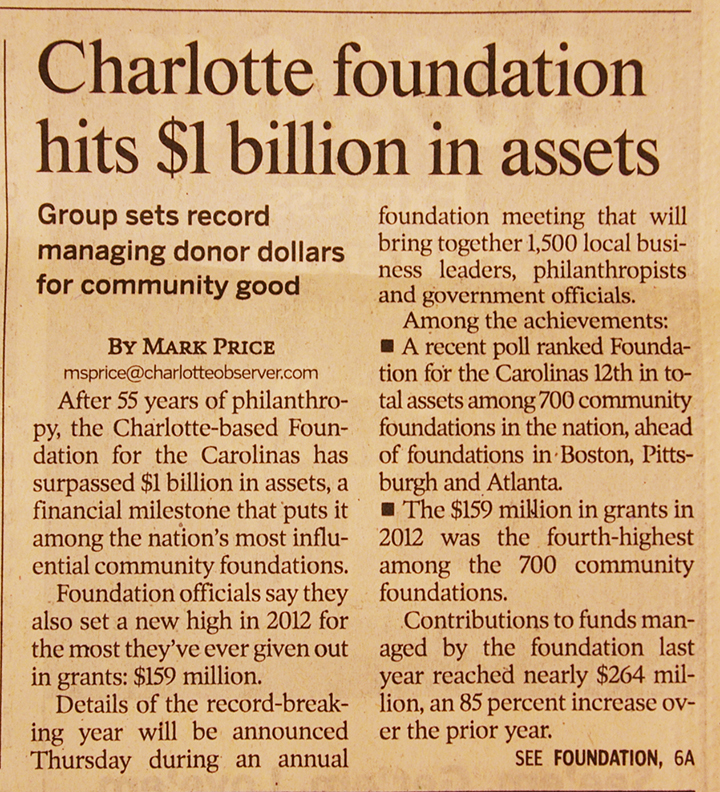 1988: The Foundation receives a $1 million anonymous gift for its endowment and another $1 million anonymous gift to create the Charlotte-Mecklenburg Schools Scholarship Incentive Program. Three more county community foundations are established. 1989: All-time record year: Assets top $52 million as The Cole Foundation ($17 million) becomes part of the Foundation. Distributions reach almost $10 million, including $1 million to build the uptown child care center at the YWCA. The Regional HIV/AIDS Consortium project is established. 1990: The Foundation helps secure $200,000 in gifts to build the new Charlotte Emergency Housing Center and receives a $1 million gift from an anonymous donor to build and endow a second day-care center at the Methodist Home. 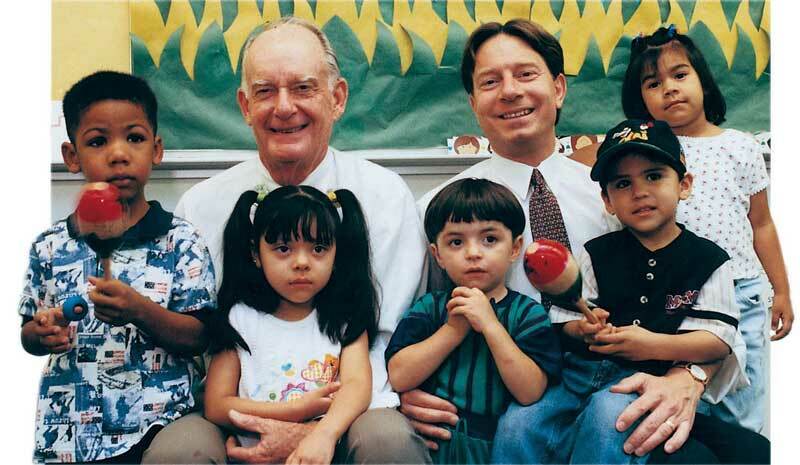 1992: Foundation sponsors ChildWatch, a visitation program, in conjunction with the Children’s Defense Fund. Hearst Foundation awards a grant of $100,000 over three years to support expansion of the Strengthening Families Initiative. 1993: Under the leadership of several African-American members of the Board, a new African American Community Endowment Fund is created to encourage and foster philanthropy to support programs and initiatives that address African American concerns and to create a legacy that benefits future generations. 1995: The Foundation passes $136 million in assets and receives the largest single gift in its history – $35 million from the estate of longtime supporter, Lucille Puette Giles. The Foundation sponsors the Pierce Report and helps create the Carolinas Land Conservation Network. The Salisbury Community Foundation, Inc., becomes a supporting organization. 1996: Gifts total $31 million. The Lexington Area Community Foundation is established with a gift from the estate of the late Casper and Ella Timberlake. Charitable grants total $17 million and set a record for the Foundation. 1997: The Foundation initiates Building A Better Future, a $2 million grantmaking program made possible by the Lucille Giles bequest. Foundation for the Charlotte Jewish Community is formed as a supporting organization. Two new communities come on board: Blowing Rock and the Waccamaw region of South Carolina. 1998: The Foundation celebrates 40 years of service to the region. The Board of Directors names the Foundation’s new legacy effort in honor of Gordon Berg, who helped launch FFTC and who served as its executive director until 1986. Assets grow to nearly $219 million. The Foundation takes the lead on the issue of out-of-school time. The Project on Out-of-School Time, or POST, is created to provide quality experiences for children and youth through diverse programming. 1999: William Spencer, only the second person to serve as president of the Foundation, retires in September after leading the Foundation for 13 years. Michael Marsicano, who served as president/CEO of Charlotte-Mecklenburg’s Arts & Science Council, is chosen to lead the Foundation. The Foundation, together with the Lee Leadership Institute and Central Carolinas Choices, launches The Impact Fund – an educational grantmaking and philanthropy experience for community leaders between the ages of 25 and 40. Stanly County becomes the Foundation’s 12th regional affiliate. 2000: The Foundation ends the year with assets of $240 million and 1,400 charitable funds. The Foundation receives a $1 million gift from the Gorelick and Luski families to purchase a new office building in uptown Charlotte. 2001: FFTC enjoys a record year in philanthropy despite the slow economy. Gifts to the Foundation rise from $36 million in 2000 to $48 million, and the number of contributions increase nearly 350 percent. Grant distributions rise from $26.4 million in 2000 to $35.4 million. In November, the Foundation moves to its new headquarters located at 217 South Tryon Street. 2002: The Foundation partners with the Arts & Science Council to create a new supporting organization, the Foundation For The Arts & Sciences. Including this new affiliation, the Foundation now manages seven supporting organization relationships such as the United Way Legacy Foundation and the Foundation for the Charlotte Jewish Community. Year-end assets total nearly $270 million. 2004: The Foundation receives record-breaking contributions of $86 million. Assets total $408 million at year-end, a 15 percent increase over 2003. This year also marks the introduction of three new Centers for giving: the Center for Personal and Family Philanthropy, the Center for Corporate Philanthropy and the Center for Nonprofits. In addition, the Foundation is an integral player in several major civic initiatives such as Crossroads Charlotte, the United Agenda for Children and the Regional Open Space Environmental Initiative. 2005: In response to requests from concerned elected officials, business leaders and parents, the Foundation convenes a task force to oversee a study focusing on a new management and governance structure for Charlotte-Mecklenburg Schools. The Foundation also connects donors, civic groups and Charlotte-based companies to those affected by Hurricane Katrina on the Gulf Coast. 2006: Record-breaking contributions couple with strong investment results to increase the Foundation’s assets to $601 million at year-end 2006. Grantmaking to nonprofit organizations total a record-breaking $72 million. To better reflect its role in protecting the region’s cultural assets and securing the financial future for the Arts & Science Council’s affiliate organizations, the Foundation for the Arts & Sciences changes its name to The Greater Charlotte Cultural Trust. 2007: Foundation For The Carolinas made its largest discretionary gift to date of $2 million (via the Charlotte Mecklenburg Community Foundation) to the Carolina Thread Trail, a 15-county greenway network. The Charlotte Mecklenburg Community Foundation awards a $1 million grant to the Campaign for Cultural Facilities. The grant is the first gift towards a $5 million effort to name the Afro-American Cultural Center in honor of former Foundation Board Chair Harvey Gantt, Charlotte’s first African-American mayor. The Partners in Philanthropy campaign is launched to build philanthropic assets throughout the 13-county region served by the Foundation. 2008: The Foundation celebrates 50 years serving the region and launches the Center for Civic Leadership to advance its role as coalition builder and community catalyst. To accommodate expanding philanthropic services and increases in civic leadership initiatives, the Foundation accepts the gift of a building from Bank of America (former Montaldo’s department store and later the Mint Museum of Craft + Design). Additionally, Sonia and Isaac Luski of Charlotte announce the gift of a significant portion of their art collection to the Foundation to be housed in a gallery in the new building. In late 2008, the declining economy takes its toll on Foundation assets, which dip to $646 million dollars at year-end. Contributions to the Foundation total $78 million dollars, while grant awards total $103 million (only the second time in the Foundation’s history that grants exceeded contributions). The Foundation’s Center for Civic Leadership launches the Critical Need Response Fund in partnership with the Leon Levine Foundation, the Charlotte Chamber of Commerce, the United Way of Central Carolinas and Mecklenburg Ministries to shelter, clothe, feed and keep warm a growing number of residents who find themselves in dire circumstances. Sandra and Leon Levine make a lead gift to the fund of $1 million. 2009: The Center for Civic Leadership launches two additional initiatives to address needs emerging as a result of the recession: The Community Catalyst Fund (promoting collaboration and partnership among nonprofits and funders) and the Workplace Giving Initiative (which studies the impact of and proposed solutions to the decline of workplace funding to the United Way and the Arts & Science Council, in particular). Despite continued challenging economic times, the Foundation’s assets rise to $754 million, total contributions increase 29 percent from the previous year to reach $101 million and 86 new funds join the Foundation in 2009. $90 million is distributed through the Foundation’s grantmaking programs. 2010: Contributions to charitable funds held at the Foundation total $209 million, the second-highest year in history. Assets reach a record $910 million, and grants to the community also set a record with $140 million (the fourth-highest in the nation among community foundations). The Center for Civic Leadership launches Project L.I.F.T. (Leadership and Investment for Transformation), a ground-breaking, $55 million, public-private partnership to support West Charlotte High School and its feeder schools in an effort to raise graduation rates and academic achievement. 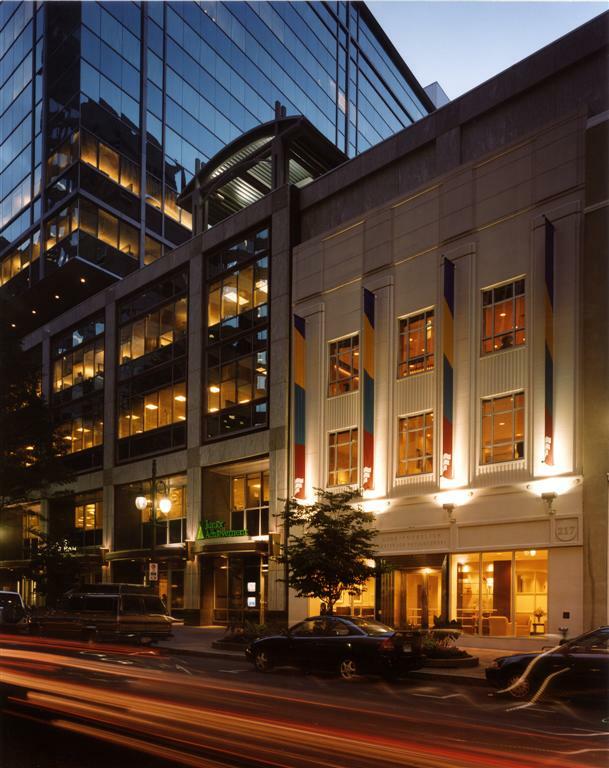 2011: The Luski-Gorelick Center for Philanthropy opens as the new headquarters of Foundation For The Carolinas at 220 North Tryon St., culminating plans that began in 2008 with the generous donation of the building by Bank of America. The building also houses the Robinson Center for Civic Leadership (re-named in honor of Sally and Russell Robinson) providing a state-of-the-art, community-convening center available free to nonprofits. The Sonia and Isaac Luski Gallery on the building’s first floor provides a fittingly beautiful environment for an extensive art collection donated by the Luski family (open free to the public), as does the remainder of the building, where a spectacular array of glass sculptures and paintings adorn the headquarters space. Total grantmaking since FFTC was founded reaches a significant milestone with more than $1 billion in grants distributed. On the civic leadership side, the Foundation is engaged in a key initiative called Charlotte Bridge Home to support returning veterans with affordable housing, educational opportunities, employment, medical care and support services. 2012: The Foundation reaches a remarkable milestone of $1 billion in total assets owned and represented in the organization’s 55th year. Two new giving options are established: Community Investments Foundation (which accepts gifts of closely held business interests) and Community Real Property Holdings (which accepts gifts of real property). The Foundation administers employee disaster relief programs for several corporations following Superstorm Sandy, which (as of the end of 2012) provides grant awards of more than $1.8 million to thousands of individuals impacted by the epic storm. On the civic leadership side, Charlotte Bridge Home helps more than 200 veterans and their families through support services, and it raises more than $1 million for a Veterans Employment Initiative to benefit veterans’ programs at Central Piedmont Community College. 2013: Total assets reach nearly $1.3 billion, the highest in the Foundation’s 56-year history, making FFTC the 11th largest community foundation in the nation of more than 700 such organizations. One of the most exciting achievements of 2013 is the launch of E4E Relief, LLC, which provides disaster and hardship relief to employees of corporations throughout the United States. FFTC also raises $35 million to complete the Carolina Theatre renovation, and the Belk families provide a remarkable $8 million gift to support the new campus, Belk Place. The project is part of a larger effort to reenergize the North Tryon Street neighborhood in uptown Charlotte. The Foundation begins working with a number of partners to create a shared vision that will catalyze development and bring new life to the area. 2014: FFTC donors gift a record $628 million to Foundation-held funds, ending the year with charitable assets totaling $1.7 billion (the 9th largest community foundation in the United States), a record $342 million in grantmaking and 400 new charitable funds for families, nonprofits and companies. The Robinson Center for Civic Leadership focuses on economic opportunity with the launch of Charlotte Mecklenburg Opportunity Task Force, a public/private partnership composed of a diverse group of local leaders intended to develop recommendations that will broaden access and remove barriers to opportunity for all members of the community. 2015: FFTC ends year with second-highest total of gifts, grants and assets (landing the Foundation No. 16 on City A.M.’s “World’s Top 20 Donors” list), and increases planned-giving expectancies from $400 million to $558 million. Center for Nonprofit Sustainability adds Queens University to a growing list of partnerships with small to mid-size colleges and universities to establish and operate endowments. Business owners and entrepreneurs utilize the Foundation’s subsidiaries to transform complex assets into community impact. Valor Hospitality Group is chosen to explore the possibility of a 20-story hotel above the soon-to-be-renovated Carolina Theatre, intended to generate a revenue stream that will support the theatre’s charitable purpose. Also, the North Tryon Vision Plan is presented to the community, offering a blueprint and potential guidelines for revitalization of the area. 2016: FFTC surpasses the $2 billion mark in charitable assets, doubling assets in just four years. FFTC launches a number of significant enhancements for fundholders in 2016, including online fund statements, expanded investment offerings and reduced pricing for standard service funds. The Charlotte-Mecklenburg Opportunity Task Force continues its work toward developing recommendations for increasing economic opportunity for all members of our community. Also, the North Tryon Vision Plan is released in 2016 and formally adopted by local government, laying the groundwork for re-energizing this vital corridor in uptown Charlotte. 2017: The Foundation surpasses the $2.5 billion mark in charitable assets, while setting a record with more than $419 million issued through nearly 29,000 grants. Continuing a recent trend in charitable giving, local tech company MapAnything announces its intention to pledge 1 percent of equity to the Foundation. Thanks to generous donors, engaged local leaders and the new Give, Grant, Grow initiative in parts of our 13-county region, grantmaking by regional affiliates increases by 25 percent in counties participating in Give, Grant, Grow. On the civic side, the Charlotte-Mecklenburg Opportunity Task Force issues its final report identifying key determinants in improving upward mobility. To help oversee the report's recommendations, the Leading on Opportunity council is formed. Construction begins on the Carolina Theatre's $51.5 million restoration, and InterContinental is officially announced as the 250-room hotel that will be built atop the structure. Due to a devastating string of natural disasters – Hurricanes Harvey, Irma, Maria and Nate, as well as the Santa Rosa, Calif., wildfires – FFTC's subsidiary E4E Relief sees record-setting numbers in both applications, more than 12,200, and grants awarded, more than $13.1 million in relief. 2018: Before Hurricane Florence hits the NC coast in September, FFTC creates the Hurricane Florence Response Fund to assist those in need. After a robust fundraising push – including national attention from a $1 million gift from Michael Jordan and an appeal by comedian Stephen Colbert, plus a separate Walmart drive that raised more than $11.3 million – initial grants are issued in December to 20 organizations supporting the rebuilding and recovery efforts. The fundraising came in a year in which the Foundation celebrates its 60 anniversary – kicking off in January with the Duke Energy Center lighting itself in honor of FFTC’s founding and ending with Gov. Roy Cooper declaring Nov. 28 Foundation For The Carolinas Day. The push for an increase in access to affordable housing is a key civic initiative, throughout the year. FFTC starts by hosting a housing summit with community leaders in May and announcing a $5 million program-related investment. The PRI is the start of FFTC’s goal of raising $50 million from the private sector to aid affordable housing and is contingent on the public voting to increase the City’s Housing Trust Fund to $50 million (which it does in November). The fund also receives commitments from Wells Fargo and Crescent Communities. Increasing access to affordable housing was a key recommendation of Leading on Opportunity, which continues to make strides: hiring executive director Dr. Stephanie Cooper-Lewter in January and, in September, helping to announce a partnership with Harvard to use its Opportunity Atlas tool to study neighborhood-specific data. In other advancements, the City of Charlotte maps its annual budget to the Leading on Opportunity report's recommendations and Mecklenburg County pursues another Opportunity recommendation with a $9 million investment for free, high-quality pre-K. And in May, on the close of the sale of the Carolina Panthers to businessman David Tepper, former minority owner Derick Springsteen Close gave a $30 million charitable gift to create the Springsteen Foundation, with an emphasis on human services, health and education.